Riley and his best friend Finn are after top prize in their school’s online film competition. The only thing missing from their amazing stop motion zombie flick – the fans! But Riley’s plan to promote the big blockbuster at a hockey game quickly gets upstaged by Finn’s jumbo screen dance antics. Finn ends up famous…and Riley ends up furious. Can the boys’ movie making partnership – and their friendship – survive? With fun-tastic zombie and movie making graphics – plus hilarious glimpses into Riley’s Movie Notebook – you’ll love joining Riley as he tries to prevent his best friendship, his action flick (and a secret crush!) from going ‘off script’! On the ride home from school, Riley and Finn talked non-stop about their movie. Their ideas were flowing like molten lava from an erupting volcano.Riley grabbed his movie notebook from his backpack. He turned to a fresh page to write everything down. He wasn’t going to let a single thought slip away! A Stop-Motion Action Blockbuster Script! Lizard Beast’s private island is under attack from an army of Special Ops soldiers who have turned into zombies. Two soldiers — with the code names “Rocket” and “Flapjack” — are immune to the zombie virus. They become Lizard Beast’s allies. The three best friends must work together to defeat the Zombie Horde . . . but time is running out! You can ask for “My Best Friend is a Viral Dancing Zombie” by Karin Adams at your favourite local bookstore. It is published by James Lorimer & Company Ltd. (paperback) ISBN: 9781459411272 or (e-book) ISBN: 9781459411289. 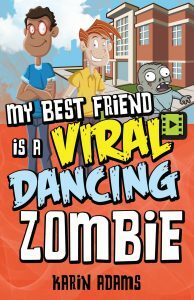 My Best Friend is a Viral Dancing Zombie is carried by most major booksellers around the world! To find an online seller in your country, or just want to see more shopping options, you can do a web search for “My Best Friend is a Viral Dancing Zombie” by Karin Adams.